Download The Entire Free eBook File HEREClodagh, 18 years old, is the eldest daughter of Dennis Asshlin, an Irish gentleman who lives in an area of Ireland called Orristown. Dennis is passionate, proud and indebted to no one. But, Dennis has an obsession with gambling that is leading the family to ruin. When tragedy strikes, Clodagh finds herself in a situation where she must defend the family honor because ‘no Asshlin is ever obliged to anyone’. She marries a man she does not love who is many times her age and is thrust from adolescence to adulthood literally overnight. Clodagh travels to Europe and mingles with people of society and fashion which through her immaturity, she believes is her right. She finds instead uncertainty, despondency, and deceit. Her emotions are constantly in battle with reality as she discovers her society acquaintances are not the ‘friends’ she believes them to be. 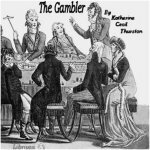 During her visit to Europe, Clodagh discovers that she too is burdened with the Asshlin curse for gambling which eventually leads to more heartbreak. A chance encounter seems to change her life and she returns to Ireland, only once again to be thwarted by the Asshlin curse. A surprise and tense ending is in store for the listener. This book was one of Katherine Cecil Thurston’s two best sellers in 1905. Enjoy! Personal Note: my apologies to our Brit friends in my mispronunciation of several British locales.